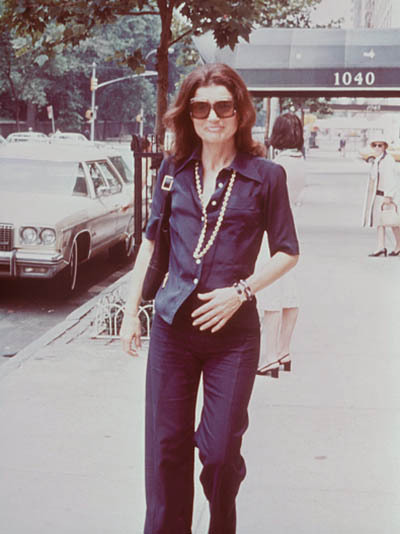 Despite the fact that Jackie Kennedy had hundreds of jewels and several watches in her massive collection, her classic gold Cartier Tank watch is among her most signature accessories. It was almost as ubiquitous as her big sunglasses during the late 60s and early 70s. 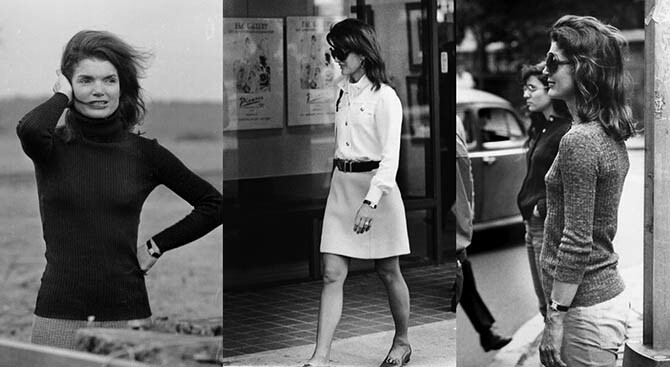 It has become much more well-known than the Schlumberger bracelets the press dubbed ‘Jackie Bangles’ because she wore them so frequently during the same period. When the former First Lady’s estate was sold at Sotheby’s in 1996, none of the truly signature accessories were included. There were no sunglasses, no Schlumberger and no important diamond jewelry from the White House period. Needless to say, the Cartier Tank watch was not in the sale. 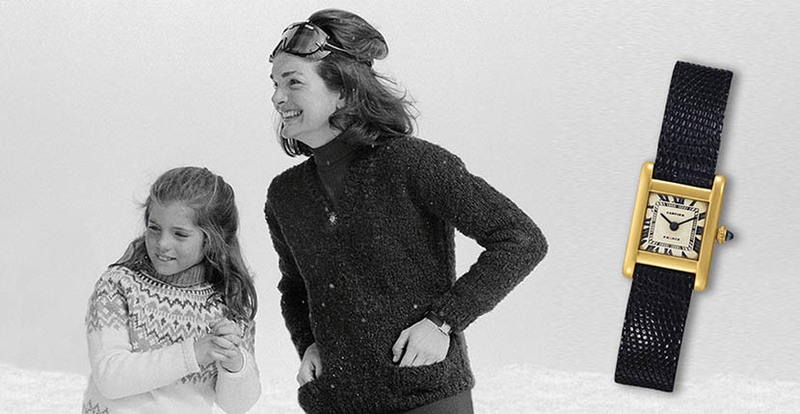 All of these deeply personal items were divided among the Kennedy family and friends. 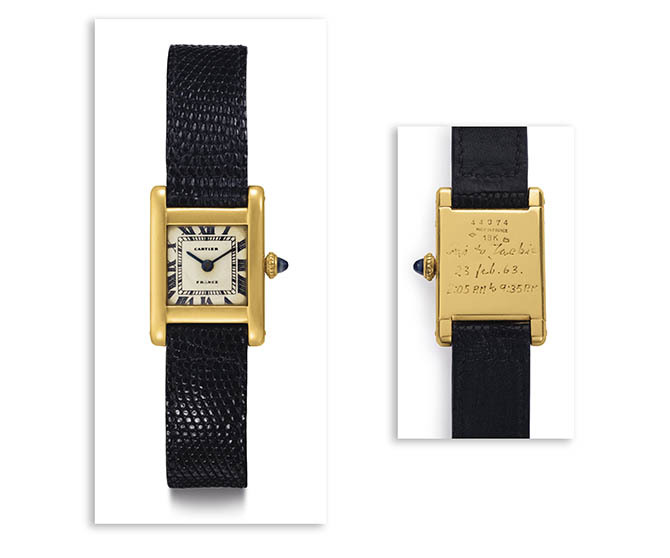 The Jacqueline Kennedy Onassis Cartier Tank went on the auction block at Christie’s on June 21, 2017 in The Rare Watches and American Icons New York sale. The watch and a painting, that ties into the engraving on the timepiece and finally reveals who gave it to Jackie, sold together for $379,500. There were a dozen individual bidders in the room and on the phone driving up the price for three intense minutes. Kim Kardashian ultimately was the high bidder on the timepiece. The history behind the watch includes an urban watch myth that has been circulating for years. The story was President Kennedy gave Jackie the Tank months before his death in 1963 and had it inscribed, “To Jackie, Love Jack.” Honestly, the alleged inscription always struck me as off by its excessive simplicity—no date, no message. Well, now we know the timepiece has far more of a complicated and touching story behind it. 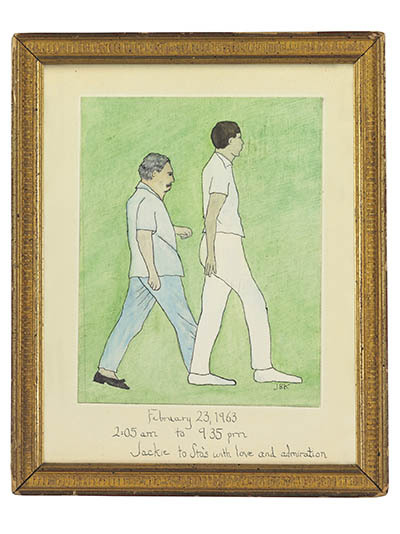 Painting by Jacqueline Kennedy Onassis of Stas Radziwill and Chuck Spalding on the 50-mile hike in Palm Beach. The times refer to the start and stop times of an infamous 50-Mile Hike in Palm Beach in 1963. The event grew out of President Kennedy’s visionary New Frontier policy that included improving the health and fitness of the country. He suggested the march to his Marine commandant after coming across an executive order from Teddy Roosevelt with a mandate for a 50-mile march to be done in 20-hours for the Marines. He also put his White House staff to the task of the hike in Palm Beach, Florida. According to The Daily JFK: “Famously dough-bodied Pierre Salinger declined but brother Robert Kennedy completed the test in 17 hours. Kennedy brother-in-law Stas Radziwill and Kennedy friend Chuck Spalding started the 50 mile hike on the just completed Sunshine highway running from Miami to Fort Pierce. They were accompanied by Secret Service agent Clint Hill, who was along because ‘the president wants to make sure that nothing happens to them.’ Also along was Dr. Max Jacobson, photographer Mark Shaw, and a Navy corpsman.